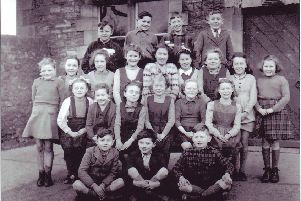 Skerton School 1950-1951, picture by Terry Ainsworth. We travel back over 60 years to look at some well-known local footballers learning the game at Skerton School in 1950-51. Back row from left shows: Mr Emmott, J Collinson, B Rogerson, unknown, uknown, Mr Nowell. Middle row from left shows: D Cohen, C Osmotherley, B Robinson, K Ireland, Reg Bailey. Front row from left shows: D Rucastle, I Craig, Ron Gifford, Bill Lockley, Ken Mount. Most of the faces have been identified but there are two on the back row who remain nameless, can anyone help? Visit www.soccernostalgia.co.uk for more photographs and articles. Contact Terry Ainsworth through the Guardian if you have any old photographs.